100-pound cover stock. Image = 33 x 22 in. Trimmed print = 37 x 27 in. 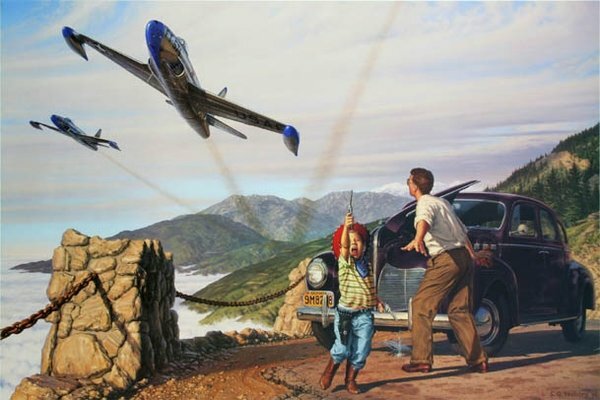 High in the San Bernardino Mountains of Southern California, three Lockheed F-80 Shooting Stars skim the Rim Highway as they return to March Air Force Base. Fall 1948 marks the first anniversary of the United States Air Force, and the freshly painted jets of the First Fighter Group sport their special blue squadron markings and the new “USAF” designation on their wings. The 94th Fighter Squadron’s commander has just put his newest pilots through a grueling morning workout over the Mojave Desert. Having slipped through the Cajon Pass, he now leads his planes in a low sweep along the mountain slopes of this calm morning air. On a turn-out, terraced 2,000 feet above the tops of the coastal cloud layer, a future Phantom pilot draws his trusty cap gun to take a quick bead on the lead jet. An anxious dad gropes for his excited buckaroo while the remainder of the flight flashes into view. In an instant the overheated “Forty” DeSoto is left in the smoky wake of the silver wonders. The Jet Age thunders its arrival and wins another devotee.